Yesterday I stopped at the Baseball Hall of Fame in Cooperstown for the first time and as luck would have it so did Mariano Rivera. It is often said that even Red Sox fans admired and rooted for Derek Jeter and while that is true to an extent - the Yankee player who had universal respect and admiration was and is Mariano Rivera. Have you ever heard of a negative thing about this man? The closest you'd get is silly grumbling that he never went to a Metallica concert or that he was "too Christian" for some people's tastes. I think those criticisms speak volumes more about the poor souls who would utter them than Rivera. 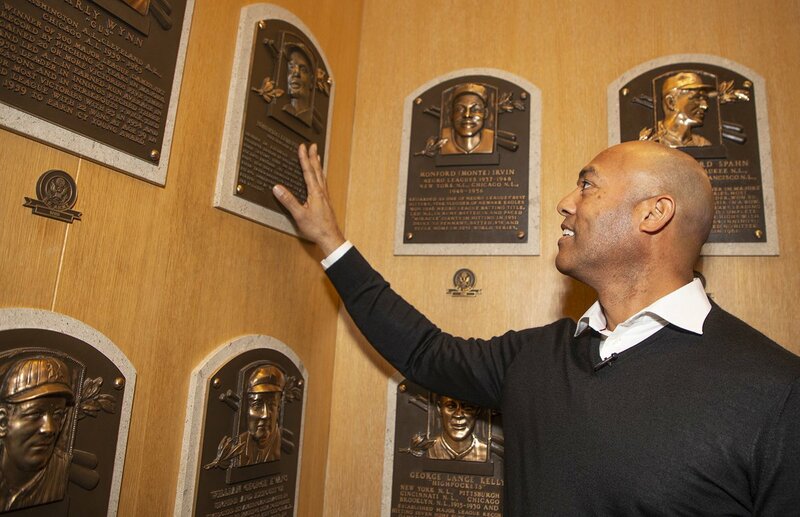 I had the honor of watching Mariano being led to various Hall of Fame plaques starting with Roberto Clemente. There was fellow Panamanian Rod Carew and various Yankees. The one that touched me the most was when he stopped at the plaque for Jackie Robinson. Mariano understands the debt all players of color owe to Jackie and he knows that it is an honor to be the last player in MLB history to wear Robinson's retired 42. Baseball could not have picked a more humble and respected ambassador to be the last player to wear 42. The final question Mariano fielded from the press was about 2001 and 2004 in which the Yankees lost to the Diamondbacks and Red Sox respectively in the playoffs. The way Rivera handled the question made me love him all the more. He pointed out that he gave his all every time he put on those pinstripes and every time he took the mound. Sometimes his best wasn't good enough to beat the other team's best. "That's baseball," he pointed out. He had "no regrets" for his career. He had to know the lows of losing to appreciate the highs of winning championships. He was pure class. Mariano Rivera is the rarest of human beings. An adult how has no regrets for the life he's led. And a New York Yankee who is beloved by Red Sox fans.